Will Toronto Housing Market Crash? Will Toronto housing market crash in 2013? I don't know. But if it does one can estimate which parts of Toronto will decline the most by looking at each district of the city. In this post we will start by looking at the big picture of Toronto's housing market and then narrow done to specific areas which experienced extreme price growth and that are the most vulnerable to drastic price declines. The Toronto Real Estate Board only provides the historical data and a chart for average price of a house (be it condo or detached) in Toronto CMA. Click here for TREB Historical Data PDF. The issue with that graph is that it covers a huge area, including Hamilton, Milton, south shore of Lake Simcoe, etc. On top of that, the area covered by TREB has changed over the years, so the validity of the data presented is unknown. 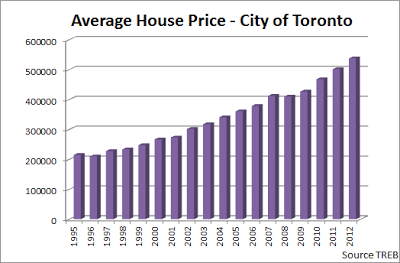 Below is the Toronto's average home price from 1995 to 2012 based on TREB data. By home, I mean a composite of all housing options, be it condo or detached house. The average prices have doubled since 2000 from about $266,000 to over $538,000 in 2012. The average price had only declined twice in the past 17 years, in 1996 and 2009. The first decline is attributed to the recession of early 1990's, and the second decline happened during the financial crisis, otherwise the housing cost was growing non stop. The average price growth from 2000 through 2012 was 6.2%. What this means is that it took 11.5 years for prices to double. The higher the growth rate, the less years it takes for prices to double. Our incomes have certainly not doubled in past 12 years, though what we almost did double was our debt. But we all know that, well maybe not all of us, but at least some of us do. But enough of that, let's go to the juicy part of this post. The City of Toronto consists of 35 areas which have their own data set of information published by TREB. I looked at all of them, I googled how to calculate percentage growth and spent next four hours on my calculator and another four in paint. Below is the local break down of home prices growth rate in last ten years in City of Toronto. Click to Expand. Likely no one is surprised to see triple digit growth in the wealthiest neighborhoods like Forest Hill and Yorkville and the lowest ones at the periphery. What did surprise me was to see a 33% price change in an area of Yonge and Eglinton (C10). In fact, I double checked my numbers a few times, but it was still the same. If anyone has any clues to why C10 area has the lowest price growth, please comment below. Another interesting observation is that the prices in the central area of downtown, C1 and C8, (both with green numbers), have experienced lower level price growth than one would expect. One of the reasons for reduced rate of growth in those areas might be the fact that they both encompass the core of downtown and what's around it. You might have heard about Chicago School Ecological model, which talks about how in every city you have a business core and around it you have a transition zone, which is the poorest zone (think Sherbourne and Dundas). Now it may be possible that certain neighborhoods in those areas are dragging the on average price growth. Or is it possible that the market views Toronto Downtown the same way as northeastern Scarborough?